If you have any questions or want to enquire about dates, use our form to contact Rubén M. Riera or see their website for more information. 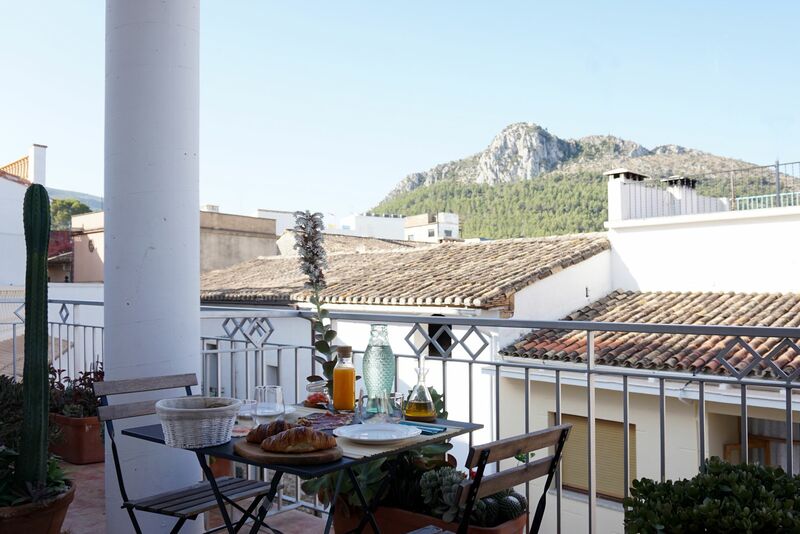 Step away from the tourist routes and immerse yourself in a traditional Valencian village with narrow Moorish streets leading off a central plaza and church. You stay in a converted townhouse, beautifully designed to let light flood in and with a roof top terrace – views soar across citrus groves all the way to Ibiza from here.Breakfast on freshly-squeezed orange juice, Iberian ham with walnuts, goats cheese and crusty bread, either in the dining room or on your private terrace. Set off into the countryside for gentle strolls through the groves, mountain hiking or the Barranco del Infierno, a challenging canyon walk with a corkscrew descent. Owner Rubén and service manager Magda look after you quietly; they can put you in touch with mountain bike hire companies and give advice on routes.Walk to restaurants in town or get in your car to explore. There’s a good flea market at Jalón (ten kilometres) every Saturday selling antiques and vintage stuff, the three Michelin starred restaurant ‘Quico de Costa’ is a short drive and there are excellent choices in Denia (20 kilometres). It’s 20 minutes to the sea for beaches, swimming and picnics. Minimum stay: 2 nights at weekends and Public holidays. Highly recommended. A charming town house with lovely views which has been stylishly modernised inside, located in a pretty town. Breakfasts were delightful introductions to some local delicacies, and the friendly host helped us to find very special places to eat; a favourite was within walking distance. Great location amongst orange, lemon, almond, olive and cherry groves, and surrounded by mountains (great for walking), yet still close to the coast. Clean bright and comfortable accommodation. Great terrace. V friendly and attentive host Ruben. 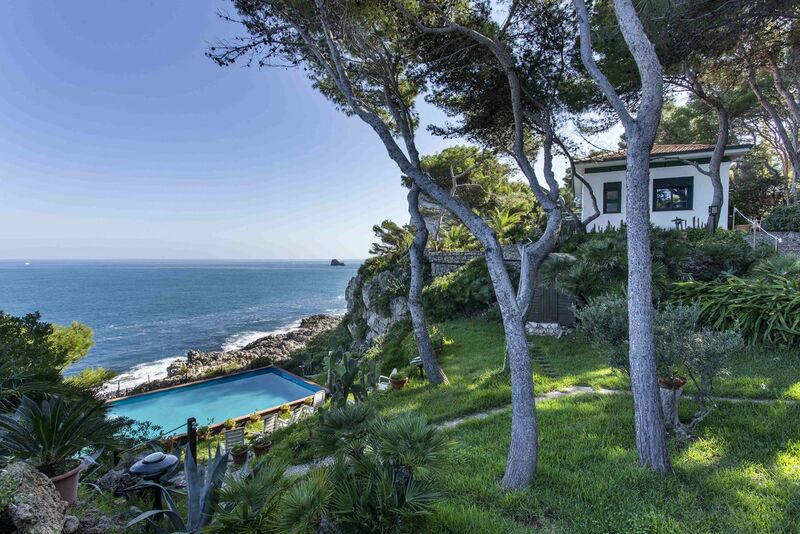 Exceptional Boutique B&B in an authentic Spanish village 10 minutes away from the coast. 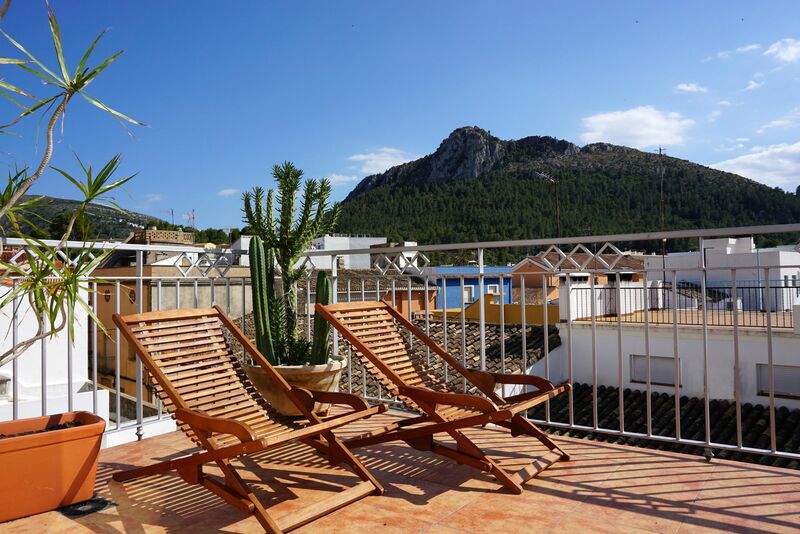 The property is decorated with an excellent taste and has a rooftop terrace with a Jacuzzi. Our comfortable room had a private terrace and every morning the breakfast was served on our terrace with beautifully presented fresh and local products. Also, the area is lovely, with a variety of different restaurants and bodegas. We would love to go back and absolutely recommend a stay in Mardenit. Orba is charming. A pretty and traditional village (cars are not allowed in the central, older part) where they still make pottery and leather handbags. It is 154 metres above sea level so the views are panoramic and you are completely surrounded by citrus groves. There are some good restaurants, a market and the church. Much influenced by its arabic past in its architecture and food the village also has castle ruins. There are fabulous walks and cycles (some very challenging) in the mountains without having to get in your car. Fine sandy beaches are dotted along the coastline and there are some serious restaurants for foodies within striking distance. WE LOVE NATURE.Next to Mardenit, within a radius of 30km, are 5 Natural Parks. The area is perfect for outdoor activities like hiking, mountainbiking, cycling or climbing. Don't hesitate to ask us for the best routes. IN SUMMER.We recommend water activities: Canyoning, kayaking and coasteering are available with our adventure company. You can also enjoy some of the most beautiful beaches in Spain in our area. THE REGION FOR FOODIES.Within a radius of 30kms of Mardenit you will find 6 Micheline star restaurants , 1 with 3 stars. In Orba and the surrounding villages we also have excellent restaurants, where you can taste authentic mediterranean cuisine. A SPECIAL PLACE FOR WINE-LOVERS.Our small region “La Marina Alta” is famous for its “Moscatel”one of the best Spanish white wines. Discover small and traditional mediterranean wineries, which treat the environment in a respectful manner. JUST RELAX & ENJOY.Our beautiful B&B has several seating areas and a rooftop terrace with amazing views of the surrounding mountains. Enjoy a delicious wine while relaxing, in Mardenit we offer a great selection of cava, white & red wines. SPEND MORE TIME AT MARDENIT.The historical cities of Valencia and Alicante are just 1hr by car. Additionally, you can reach the ferry to Ibiza and Formentera within a 15 minute drive from Mardenit. Both islands are perfectly suited for a day trip. Rubén is an accomplished, award-winning artist who graduated from Valencia in Fine Arts, then took an MA in Engraving and Graphic Design in Madrid and studied Plastic Arts in Mexico City. He has exhibited all over Europe and his 'Mardenit' was conceived in partnership with architect and interior designer Xavier Pastor. He and his partner Magda live in the village. They’re welcoming and professional, happy to help you plan your trips or leave you to do your own thing – you’ll get a code for the door.